Be the first to share your favorite memory, photo or story of Domenick. This memorial page is dedicated for family, friends and future generations to celebrate the life of their loved one. 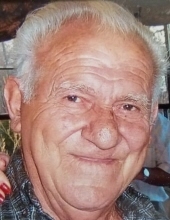 Domenick Meduri, 87, of Bushkill, passed away on Monday December 3, 2018 at the Lehigh Valley Hospital Pocono. He was the loving husband of the late Rose Meduri. Born January 3, 1931 in Pittston, Pennsylvania, the son of the late Bruno and Paulina (Frederico) Meduri. Domenick lived and worked in New York City and moved to Bushkill in 1975. There he started a construction company with his two sons. He was purely a family man, he enjoyed cooking, flying his pigeons and working outside. Domenick was a devoted husband, father, grandfather and great grandfather and is survived by his children, Pauline McCreery and her husband Dan, Francine Moore and her husband Barry, Bruno J. Meduri, Donny J. Meduri and his wife Nancy, Kim Malone and her husband Bobby. His grandchildren Anthony, Rosemarie, Domenick, Joseph, Olivia Rose, Brendan, Brianna, Natalie and Ryan. There will be a viewing on Saturday December 8, 2018 from 4:00pm to 8:00pm at the Bensing-Thomas Funeral Home, 401 North 5th Street, Stroudsburg with a Catholic Prayer service. Burial will be in Monday December 10, 2018 at 11:00am in the Sandhill Cemetery, Shoemakers. To plant a tree in memory of Domenick Meduri, please visit our Tribute Store. "Email Address" would like to share the life celebration of Domenick Meduri. Click on the "link" to go to share a favorite memory or leave a condolence message for the family.